For Sale - Bodsy Bars! Ok, technically tree sliders, but it doesn't roll off the tongue as easily as Bodsy Bars. My own set of these have been in extensive use in many challenging terrains, helping me negotiate trees by using the bars to protect the car whilst it pivoted around it in some rutted woods. They have also been hung up on rocks, protecting the underside of the car as well as the doors. Most people will rarely be in that situation, but they also serve as very useful door protectors in car parks, and not forgetting that they do make the car look pretty serious as well! These are made of strong 5mm plate with 48mm tube 3mm thick. 4 additional support tubes provide excellent robustness. There has been plenty of discussion around how much protection bars provide, so thought it would be easier to describe with Pics. First, the measurement out from the wheels. They protrude from the car slightly further out than the door handles, using a spirit level, that’s about 50mm from the centre caps on the front and rear wheels. The Spirit level showing which part of the door handle it’s level with. Then onto the protection of the door, these stand proud away from the door protection strip by 23mm these were fitted by LR, so should be at the std height although your protection strips may be at a different height. Anyone can get these things powder coated cheaply, the trick to a long life, is to get them powder coated properly. The powder coating is being done by a company that often deals with coating Aircraft parts, so they are very used to dealing with high quality output with fine tolerances on quality. They are then powder coated in polyester powder and cooked again at 200degrees C to cure the powder. The end result is that you have an incredibly robust finish that will last a significant period of time. If you do use them as intended in the rough stuff, then when you do scratch them when you hit a rock, the protective coating process undertaken, will stop the traditional peeling/flaking that you see in cheap powder coating. Here’s an example of the same Tree Sliders coated in the same process 3 years ago that were scratched around 2 years ago. This pic was taken a couple of weeks ago. There has been no additional coating put on to protect it after the damage, yet none of the powder coating around the scratch has started to flake. These are held onto the car with bespoke stainless steel cup washers and fixings into the existing holes in your vehicle once the plastic trim has been removed. There are more expensive Tree Sliders available and we all know someone who can ‘knock something up’ at a cheaper price using thiner materials or a cheaper powder coating process, or not really out far enough to protect, but overall, the protection and quality of finish that the Bodsy Bars represent, I think you will be hard pressed to beat. The Bodsy Bars are available for Pre-Christmas Collection/D3Courier service/Delivery for £499 inc VAT plus delivery at cost. They will all come with a VAT invoice. Do peeps get a T-shirt saying "barred by Bodsy"? Do you have any close up pics of the finish Bodsy? I'm after a strong solution that has very neat welds and doesn't look out of place on a nearly new motor. For clarity I assume they will fit D3 or D4? They look spot on Bodsy. Hope the sales go well. If I didn't already have a set, I would be seriously thinking about these. D3 HSE TDV6 Auto. Bonatti Grey. 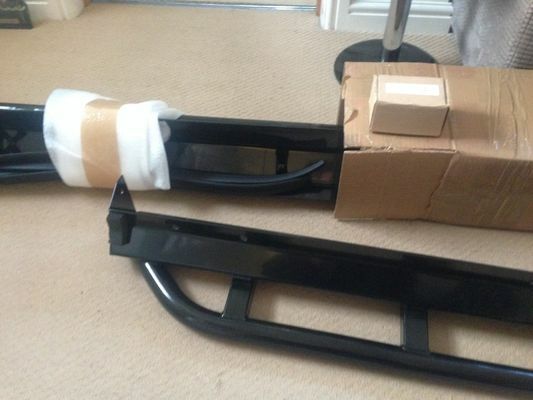 Had I not finally got my Prospeed bars I would of got a set of these! Producing 20 sets for this batch, will be ready 4 weeks or so. The coating takes longer to do than I'd like, but that's the price we have to pay to get the coating process right. Dubbs, I'm looking to get a clean sample pic for you.